If you read our recent blog titled “Summer Lawn & Garden Care” you know very well that Hendricks Feed & Seed Co., Inc has numerous products to help keep your lawn and garden in good health all throughout the growing season. 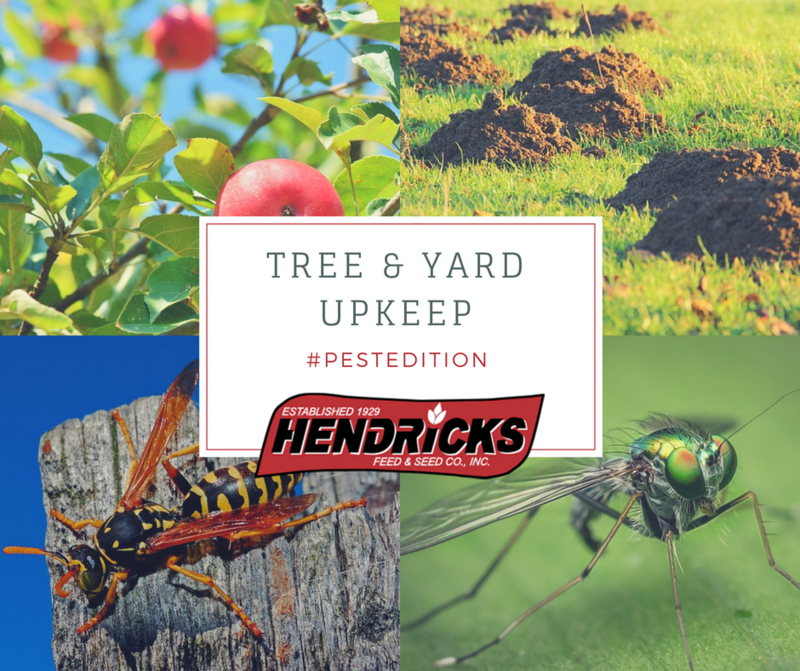 We thought we would expand into a few more products more specifically related to common yard and garden pests that also help with trees in your yard as well as insect problems. 1. Fruit Tree Spray: Fruit trees are a beautiful addition to any yard and they can provide fresh, healthy fruit every year. Did you know that our fruit tree spray controls both diseases and insects? It can also be used on flowers, ornamental evergreens, and strawberry plants. Our fruit tree spray comes in a pint container and mixes up 21 gallons to provide protection all season long. 2. Wasp and Hornet Killer: Spray away wasps and hornets from 27 feet away with our Spectracide non-staining wasp and hornet killer. It takes care of wasps and hornets fast. We also carry Eco-Smart Organic wasp and hornet killer that is effective on wasps, hornets, yellow jackets and other pests. It’s safe to use around children and animals and is also fast acting, killing on contact. Keep the area around your home safe from these pests. 3. FlyZap Aerosol Plus: This great product helps control numerous pests including House Flies, Horn Flies, Stable Flies, Horse Flies, Face Flies, Deer Flies, Gnats, Mosquitoes, Small Flying Moths (millers), Asian Lady Beetles, Roaches, Waterbugs, Sowbugs, Spiders, Centipedes, Ants, Crickets, Wasps and Hornets. Fly Zap Aerosol Plus contains the quick killing botanical pyrethrum (which is an extract of a chrysanthemum flower). It provides effective control of insects upon direct contact with an added benefit of repelling these insects to aid in a more complete control. 4. Mole Killer: Anyone who has had a mole problem knows that they are very destructive. Our Motomco Mole Killer Poison Mole Worms can help you control mole problems. This mole killer mimics the mole’s natural food source. Stop moles once and for all with the mole killer solution. With Hendricks Feed & Seed Co., Inc you can shop online or visit us in-store, and we are always available to take your calls with questions about any of our products. It’s our goal to help you keep your residential or commercial property look it’s best and keep it free from pests.